Many of the health remedies used by our grandparents have proved to be truly effective. This includes the grain sack pillow. The grain-filled pillow can be used for heat and cooling therapy. It is applied as a traditional remedy for bruises, headaches, contusions and toothache ‒ to mention but a few examples. After use, the outer cover of the pillow can be easily removed and washed ‒ so that your grain sack pillow can be reused again and again. 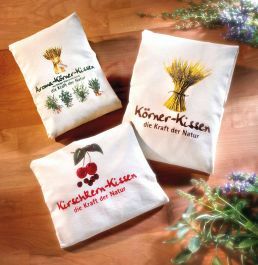 Included in the package is a product description with information on how to use the grain sack pillow. A total of ca. 850 grams of grain filling is concealed in the pillow, which is certified according to Öko-Tex standard 100.